Google Maps for iPhone has arrived and it’s available to download right now from the App Store. The easy to use app is free and includes an intuitive interface, voice guided turn-by-turn navigation, Street View, public transportation directions, and perhaps most important for many users, the routinely accurate Google Mapping data engine. If you’ve been frustrated with any of the issues with Apple Maps, then you might be particularly thrilled to have Google Maps around on your iPhone home screen again. Even if you have no complaints about Apple’s solution, it’s still a worthwhile download for the Street View feature and public transit options alone. Many of the features that we have become accustomed to from Apple Maps work very well, including the aforementioned voice navigation, which is a really nice addition. Even little things like tapping the compass to reorient north and south work the same in Google Maps as they do in Apple’s offering, giving an idea of how well made the app is. Perhaps the only valid complaint would be that the app is not yet sized for iPad, so if you wish to run it on a larger screen iPad or iPad Mini it will have to run the iPhone version in 2x mode, though apparently an appropriately sized iPad version is currently in the works. 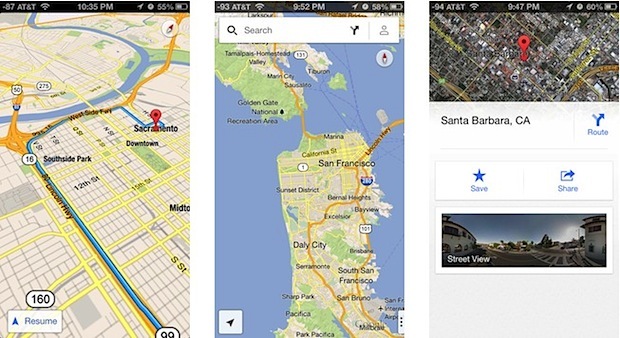 Google Maps for iOS supports iOS 5.1 and later, including the iPhone 3GS and iPhone 4. Some option safe limited to newer devices though, like turn-by-turn voice navigation, which requires a 4S or newer. Installing Google Maps on the iPhone will have no impact on Apple Maps, both apps will reside alongside one another in iOS. How is this any different from creating a shortcut on your homescreen to the mobile google maps site? I feel like people were too lazy to do that in the past and just wanted to complain about anything they can. Wrong… So very, very wrong! The maps app actually works at a reasonable frame rate on A4 devices. The google maps web app does not (Especially when trying to change the route that they give you). It’s amazing! Where I live actually exists again! Seems to be great compared to Apple one. I have an Iphone 4 (Verizon CDMA version) and it does the turn by turn voice nav. Perhaps you meant that just the 3gs and earlier will not run it? The vector-based Apple Maps are much faster and smoother to use than Google’s bitmaps. Also Apple’s maps remain the default mapping service in iOS so other apps are stuck using it. Last, I think I prefer the web-based Google Maps to this new “native” one as it runs on all mobile devices. The app is based on vector maps. How about giving it a try first? At the end of that video it says “It’s here.” I’d have put the text “It’s here (again).” at the end of the video. I’m wondering what this will do to Apple Maps. Everyone will use Google Maps again, so they stop using Apple Maps, so no one will report any more problems, so it takes even longer for Apple to get their own Maps app to a higher level, so everyone keeps on using Google Maps, because it’s better. Well, not everyone. I almost never used Google Maps, because the mapping service of my country is way better than Google Maps in my country. Only problem is they only have a website which isn’t even optimized for mobile devices. Still I prefer their website, because of the quality of the maps. Um, I was under the impression that both the 3GS and iPhone 4 supported turn by turn. I feel like Christmas just came early. My iPhone is complete, once again. Wish I had this a few days ago. I needed to go somewhere that didn’t exist on Apple Maps (first time that’s happened to me with the app…I’ve had better luck than others). Fortunately, Google knew where it was, but the web app is more difficult to use while driving. The iPhone app on an iPad is still lame. The browser Google Maps is far better for 2d mapping on an iPad (and the IOS 5 Maps was even better). Let’s get the iPad specific version developed! I think this is for US only. I can’t find it on my iphone app store. neither in my app store.